As part of our 10th birthday celebration we would like to offer a very special workshop with our friend and world renowned djembe master Iya Sako! Expect some beautiful traditional Guinean rhythms and a patient and encouraging teaching style. Workshops will be supported by Tanantemembers and will give students the opportunity to learn both the djembe and the dun duns (bass drums). Also don’t miss the gig in the evening to see Iya doing his thing on stage… a genuine world class percussionist, you will not be dissapointed! 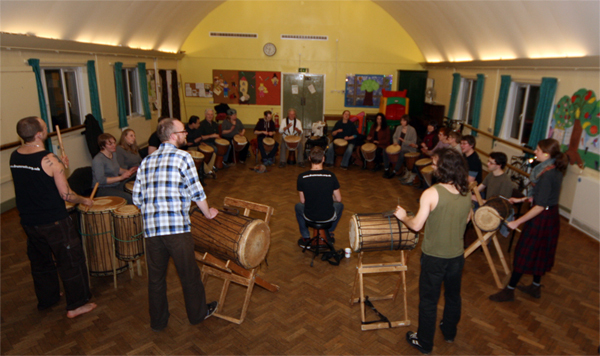 Manchester longest running West African Drumming class. This mixed-ability drop-in class is good for beginners and experienced players – and at the start of each month, we begin a new rhythm, giving participants the opportunity to learn both djembe and dundun. We teach basic accompaniments, bass lines, arranged breaks and solo material, plus traditional African songs, working as a group towards an overall understanding of the music.